Sabre MARS is the result of extensive research and development; the culmination of Sabre’s 20 years’ experience in the manufacture of resuscitators. All models are designed to meet BS6850:1987 for ventilatory resuscitators. Whilst there are many versions of the Sabre MARS, they are all based on the same design philosophy – enabling the carer to concentrate on looking after the patient, not on operating the equipment. With Sabre MARS the operator does not have to make judgements on the lung capacity of the patient to select a tidal volume; only the basic size or type of patient being cared for. Once this simple operation has been made the MARS will control both tidal volume and pulse frequency within the parameters laid down in the British Standards. Even if the wrong setting is selected there is no risk of over inflating the patient’s lungs. The MARS always ‘fails safe’ and will vent excess gas whilst giving the operator an audible warning that the equipment is not being used correctly. The performance specifications shown are common to all MARS units but it must be emphasised that MARS is available as a range of products designed to meet various operational requirements. The gas supply passes through the automatic channel and is delivered to the patient as a specific inhalation/exhalation breathing programme in accordance with the patient’s size, as set on the flow selector. When consciousness is regained, the patient will draw gas through the patient valve from the demand supply side of the module. The sensing of this flow instantly shuts down the automatic breathing programme. Should spontaneous breathing lapse the module will sense the lack of flow; and volume cycled resuscitation will resume within 4-6 seconds. Set at 45cm H20 pressure and mounted in the patient valve, an audible warning of airway blockage or over-pressurisation of the patient is given to the operator. Mounted in the patient valve, the override trigger enables the operator to perform initial lung saturation and manual resuscitation. On operation of the trigger, the automatic cycle will shut down but restart if the trigger is not re-operated within 4-6 seconds. The Sabre MARS isolates the patient from the surrounding atmosphere allowing resuscitation to take place in toxic environments. Air or oxygen? Generally Sabre MARS systems are supplied to provide patients with 100% oxygen resuscitation and oxygen therapy. 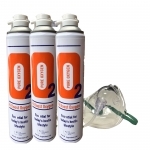 However, in certain environments oxygen cannot be used and therefore the full range of Mars resuscitators are available with compressed air. 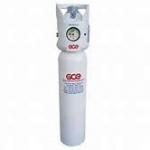 We can offer a comprehensive range of both air and oxygen cylinders for use with MARS. Customers who already have cylinders from their old resuscitators need not buy new cylinders, MARS oxygen resuscitators are compatible with all medical pin index cylinders. Bullnose regulators can also be provided if required. Sabre also supply a comprehensive range of air couplings for use in conjunction with both breathing apparatus and valved breathing air cylinders. We offer a wide range of options on outlets from the medical pin index regulator. Normally, the regulator is supplied with one oxygen resuscitation outlet (BS5682) and one oxygen therapy outlet to 11 flows 1-15/25 litres per minute inclusively. This means the one regulator can be used at 1-6 litres per minute to give medium concentration oxygen, or 8 litres per minute for a nebuliser, or even 15 litres per minute for a non-breathing high concentration mask and valve mask squeeze bag. Another feature of the Sabre MARS resuscitators is simplicity of servicing. It is recommended that only two components are replaced annually; this can be undertaken by the customer. If required, we will service units on the customer’s behalf either on a needs or contract basis. A full and comprehensive range of spare parts is available. The regulator is manufactured from high quality Brass and is available with a full range of high pressure connector types.